Amazing Dallas Landscape & Pool Designs – Stunning, Isn’t It? When we think of some of our finest pools we’ve built, we can’t help but look back and smile at the memory of creating this swimming pool on Saint Albans Drive. Now we can’t take all the credit, our homeowners crafted some pretty amazing landscape designs as well. All of it combines to compliment the look of this gorgeous backyard. You may have heard the term, “planning makes perfect.” This pool required nearly four careful months of planning to bring it all together. We walked our homeowner through each step of design. From selecting color schemes, pool and patio layouts, lighting and cleaning systems, as well as automation systems we worked diligently to bring this pool to life. At Summerhill Pools, you may have noticed that we like to write a lot of articles to talk about some of the techniques and designs we use to pull off some of these amazing backyards. This yard is no exception and we are excited to dive in with you and provide ideas and suggestions for your own backyard. Well then, what are we waiting for? Let’s get started! Of the many immaculate design features of this backyard, we are always stunned by the complexity and beauty of this outdoor fireplace. 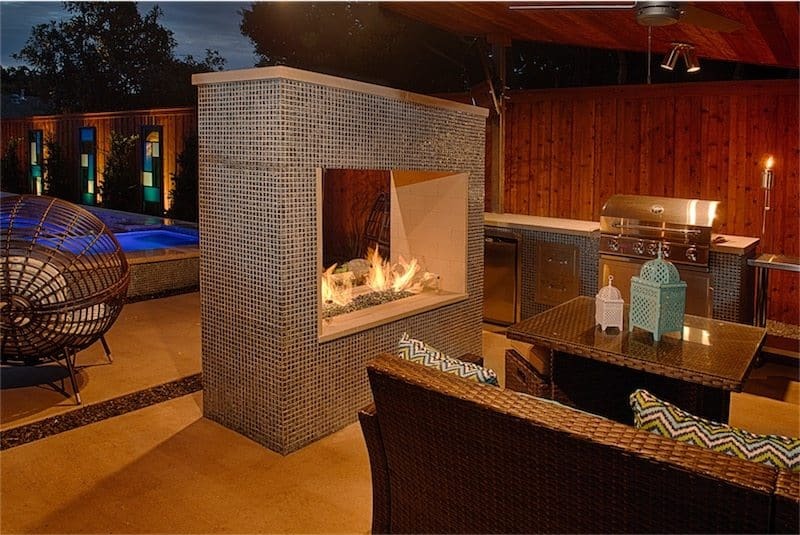 This feature is constructed of hand laid 1″ x 1″ tile pieces and includes a rectangular fire system with an electronic igniter. Complimented by 1/2″ reflective fire glass, this fire pit is design to illuminate every ray of light to provide both warmth and awe to its viewers. 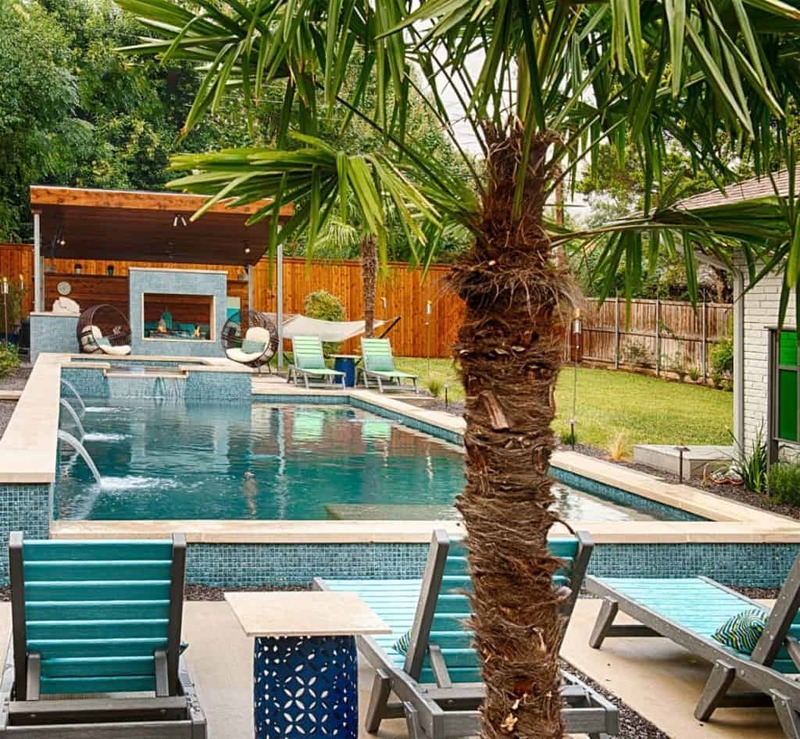 When designing a backyard oasis, every detail matters. Each tile, stone, landscape bulb, accessory and color all combine to create a unique look tailored to your specific layout and usage requirements. It sounds complex and can be a bit daunting, especially if you don’t possess the artistic eye. Rest assured, we have some amazing designers on our staff who have been around long enough to see it all. And if that isn’t enough, we have lots of pictures and plenty of examples that make selecting each piece a little easier! Mark McCaffrey himself oversaw the construction of this project. This pool provides amazing views from every angle. This image shows off a relaxing viewpoint of the outdoor kitchen and fire pit from the guest seating area. The palm tree is a great tool to provide shade from the heat of summer and gives your guests another place to relax during outdoor events. As we previously mentioned, we constructed this pool in as little as 10 weeks. That’s lightning fast in the pool world. To provide some insight into the complexity of this construction process we will outline some of the details below. We absolutely love the raised pool edge of the Saint Albans job. It is truly beautiful to see a pool elevated above the pool deck because it adds an extra layer of complexity. 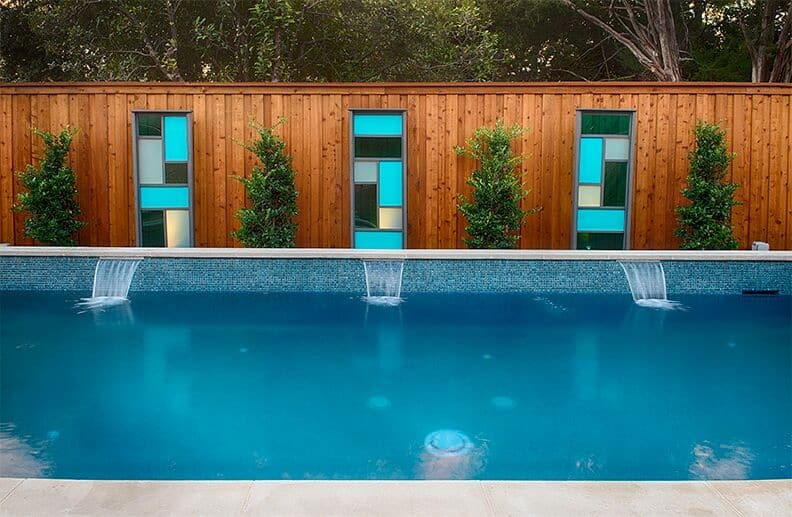 This gorgeous tile line wraps around the entire pool and adds an additional layer of detail that most pools don’t. In order to create this gorgeous feature, we needed to add a lot more Steel and Shotcrete to reinforce the raised beam. Water is a very heavy substance when contained in large volumes! In order to store the water safely and protect the pool shell, it was imperative to add additional material. Another hidden element of this raised pool edge is the double-sided coping. All pool coping is comprised of either poured concrete or natural travertine. These coping panels (often 24″ long) come in varying degrees of edging. Some are smooth and others are jagged and straight. We selected a Double Bull-nosed Coping which essentially means its honed and textured on both sides. For more information on this topic, we suggest visiting our vendor’s (QDI) website for a complete list of colors, shapes, and sizes of pool coping. 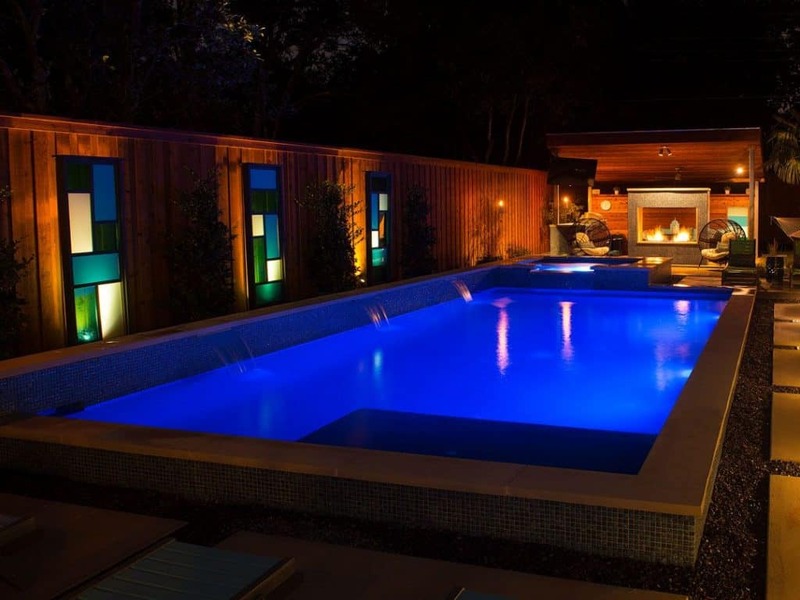 This image illustrates how striking and beautiful this backyard can become at night. As the daylight fades, this backyard is transformed into an entirely new space with gorgeous ambiance and comforting hues to entertain all. Truly a sight to see! As you already know, designing any feature of your house requires investing time and research to choose the right materials for the job. Materials must be selected based upon design, functionality, usage and customer preferences. Because we know the industry from nearly 30 years of experience, we have a large basis of knowledge to provide you with the best material and vendors to create the design that is just right for you. Selecting all of these materials provided us with a unique look to fit our customers and their family perfectly. Our focus was entirely centered around creating a space designed to entertain and wow guest and family. Our raised tile wall (located along the fence line) provides a fun and playful attitude. These glass towers were selected by our homeowner and they accent this raised tile wall perfectly! We couldn’t have done it better ourselves! View Our Other Amazing Work! As previously stated, we love sharing our work with our customers! We hope you enjoyed reading this article on our work at St. Albans Drive. There is so much detail involved in every project that it’s hard to fit all of the details and things that we want to share in a single article. In any event, we invite you to read through the other amazing pool jobs (listed below) and as always, we would love to hear from you!